You and whats left of your small platoon. Attempt to take back a village over ran by the germans. Last release I played by Gunrock is for me the best one because it, this time, integrate some voice acting. 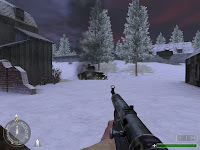 It has also have to be mentioned that every map by Gunrock visit a different theme and alway with the same quality. The objective is to take back a village still held by german except the name everything really makes me think to the battle of the bulge. 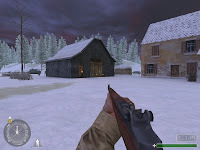 Note that it seems to be a lot negative comments on COD file that critics the use of prefabs that doesn't for me runed the gameplay but should have been mentioned in the readme. Design of this map is one time more well handled, the terrain isn't flat progression is streight forward with sneaking, taking a bunker and after the village. General view architecture and all stuff are perhaps not always build in a perfect realistic way but all locations have at least a good squaled and creativity. Gameplay is well balance and enhance through you progression with your team by some well design ambushes and the use of enemies respawn add a little bit challenge to this map, in comparaison with previous reviewed releases from Briant. It's an enljoayble experience that integrate everything to make a great map sadly it's still too short in design and gameplay to be a top notch map. In conlcusion: Last review map from Briant is for me the best one I have no experience in COD mapping and so i don' t consider critisizing the fact to find some IW prefabs. The is a good team speach an enjoyable layout a good gameplay sadly it's way too short but fun for a short time.